In seasons past, the Calgary Flames were no strangers to slumps. Losing streaks happened often, and for stretches at a time. And as depressing as it was to be unfazed by losing ten games in a row, the Flames dealt with this at least once a year. In fact, some would have even said that entire seasons were “slumps,” as the Flames progressively got worse with every season since their Cup run in 2004. Yet since embracing a rebuild and slowly building a roster filled with young talent, chemistry and depth, the Calgary Flames became 2014’s pleasant surprise. The first few months saw the team rubbing elbows with some of the league’s dynastic teams, and even knocking a few of them out of the top spots in standings during some weeks. At one point, the Flames sat proudly in third overall, beating playoff regulars the Pittsburgh Penguins, Chicago Blackhawks and L.A. Kings. It’s easy to get used to success, especially when it seems like there is more of it to come. The Flames rolled through November winning nine of their thirteen games and were looking to continue the trend throughout December for a little holiday cheer. 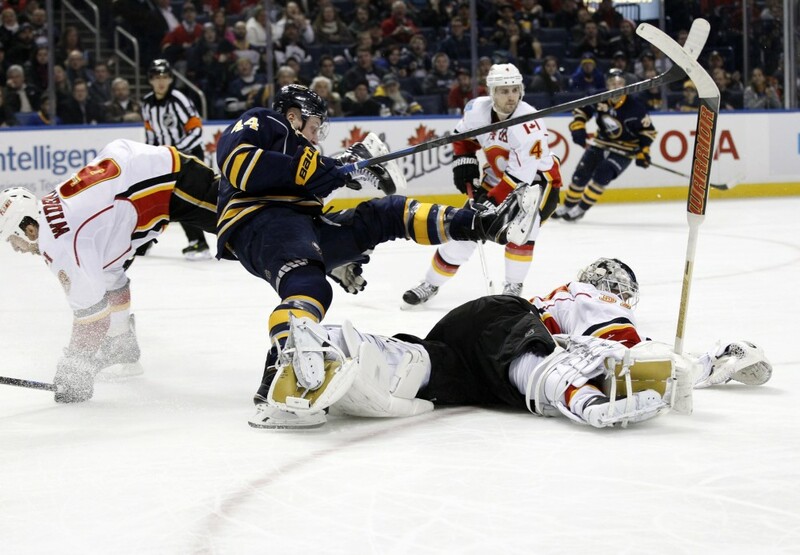 Unfortunately, the hockey gods were not quite as generous to the Flames as they began their ninth week of the season. It began promising enough, with a come-from-behind overtime win at home over the Colorado Avalanche and and former Flame Jarome Iginla. 2013’s sixth overall draft pick Sean Monahan overshadowed and outplayed his fellow draft classman and first overall pick Nathan Mackinnnon (Mackinnon was held off the scoreboard for the entire game, while Monahan picked up an assist and scored the game-winning overtime goal). But from there, it all went horribly, horribly wrong. A subsequent loss to the San Jose Sharks wasn’t too much of a shocker, although the Sharks went on to lose their next game to the atrociously bad Edmonton Oilers. Then came the Toronto Maple Leafs, who buried the Flames 4-1 to an ecstatic home crowd in Toronto. And then it was the Buffalo Sabres, a team that’s been so down on its luck of seasons late that their running joke is that they can’t win anything…not even the draft lottery. And then it was Pittsburgh, Chicago, New York, Dallas and Vancouver. Yes, eight losses in a row. The Flames’ losing skid sent them from ninth in the league to fifteenth, and just out of playoff contention. The team and its fans found themselves in an all-too-familiar spot: fighting to avoid the bottom of the standings. Yet despite being winless in three straight weeks, the Flames didn’t lose hope or push the panic button. In fact, both management and Flames fans still had so much faith in their organization that Bob Hartley was awarded a multi-year contract extension, and the C of Red was nothing short of thrilled with the decision. Just like their mentality on the ice during games, the Flames kept on trucking through, regardless of a miserable Weeks Nine and Ten. And just like their comeback-kid MO, the Flames found their way back to their winning ways, as the month of December came to a close. Appropriately enough, it was 21-year old Johnny Hockey who ignited the Flames once again, going on a hot streak to end his first year in the NHL. 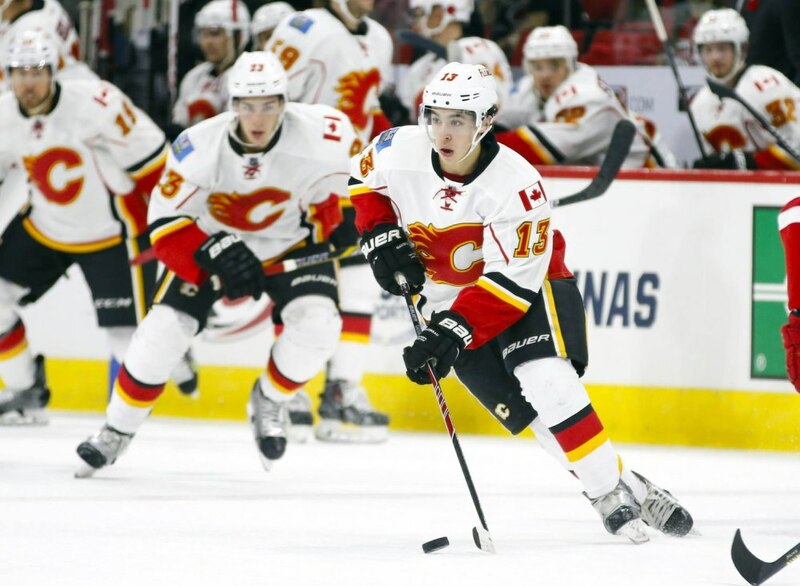 Six goals in three games (three of them coming in hat trick form against the reigning Stanley Cup champions the L.A. Kings) and suddenly Johnny Gaudreau’s name jumped to the forefront of Calder consideration. The Flames faced off against the Kings and the Edmonton Oilers twice in their last four games of 2014. With the aforementioned hat trick by Gaudreau, they topped the Kings 4-3 in overtime, kickstarting a mini winning streak to end the year. Next, they handed the Oilers their ninth straight loss, asserting their claim to be the Alberta team that isn’t the worst in the West. The Flames beat Edmonton and L.A. once more each for good measure, and never to skip on the dramatics, chose their New Year’s Eve game to throw in a signature come-from-behind overtime win. At the start of 2015, Mark Giordano was unofficially given the award for most underrated and impactful defenseman for the previous year. The undrafted 31-year old, who was the unanimous decision for captaincy once Jarome Iginla left, has quietly and consistently built a solid blue-collar foundation for the Flames. In the wake of a month filled with losses, the Calgary Flames said adieu to 2014 with a Norris contender, a Calder contender and as a whole, quite possibly a playoff contender. Stay tuned for Week Eleven of The Flames Files and follow the Calgary Flames’ progress in the 2014-2015 season.